This story was written for Corona Extra Canada, for their Winter 2016 "Closer to the Sun" campaign. This is post 7 of 8. The original blog can be found here. 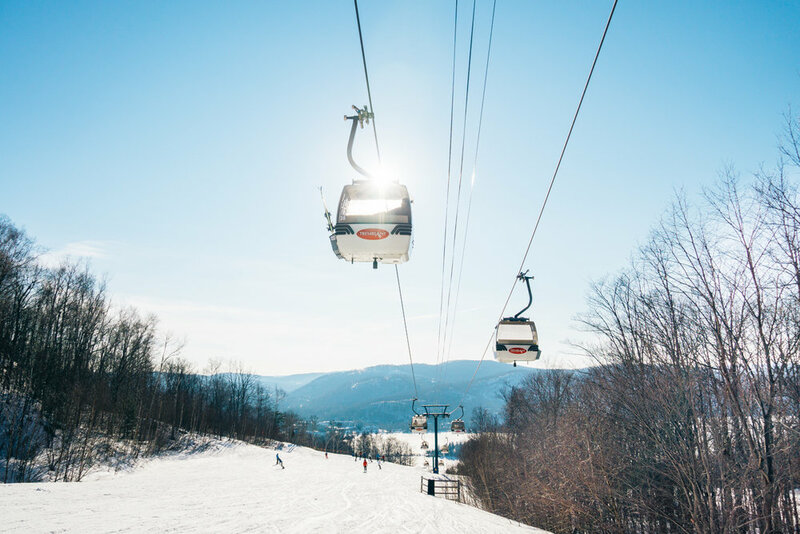 Switch your base layers for a T-shirt, grab your polarized lenses and a cold Corona - spring skiing has arrived in Mont Tremblant! While the western peaks of Canada are still reveling in fresh powder, this eastern golden child’s snow pack is slowly vanishing. The lively atmosphere, however, is anything but fading. On the contrary, the quaint town’s après-ski vibes are pumping. With visions of slushy snow, sunshine, and maybe even a goggle tan, Mitch and I pulled into town with high hopes for the last leg of our trip. The area was buzzing with activity: speakers were propped against the mountainside blaring retro hits into the village below, the buildings’ vividly painted exteriors shown joyfully in the afternoon light, and an influx of lawn chairs were strewn haphazardly through the town center. Though the hill was crowded with enthusiastic skiers and borders, you definitely didn’t have to hit the slopes to enjoy the mood. Judging by the sunbathers adorned in casual clothes, as well as those in ski gear taking long breaks off of the mountain; the peak was a secondary high to the ongoing fiesta below. Mont Tremblant was doing the après ski scene right. Mitch and I basked in the town’s happenings, but also ventured off for a different kind of post-slope celebration. We dipped in the hot tub with a few close friends and, from our jet-induced state, could still catch sight of skiers squeezing in their final runs. For the first time on our trip, it was warm enough to sit on the water’s ledge with legs dangling below- without turning into an icicle. In fact, my pale skin scored a teeny, tiny tan line. Once the sun’s rays drifted away from the mountain and dusk engulfed the resort, winter’s chill was quickly revisited. The patio’s fireplace was turned on high, hors d’oeuvres were devoured, and limes were popped into chilled Coronas. As an added bonus, the mountainside speakers continued playing music long after the lifts closed down. The final leg of our trip continued much like this- playing and unwinding, unwinding and playing. We visited the Scandinave Spa, marveled at summit views, screamed our heads off down the tube course (okay, so that was just me), sliced through spring’s slush, and warmed by the town’s ongoing fire pit. We even harnessed our inner-foodies by indulging in creative poutine dishes, and most importantly, found out Coronas pair well with late-night beaver tails. With full bellies and endless mountain memories, it’s safe to say we saved the best for last. Mont Tremblant, au revoir.